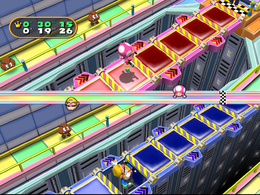 Hip Hop Drop is a Duel Minigame in Mario Party 7. Both players are on Pogo sticks, and must cross a large bridge made of square tiles. A button appears on the tile directly in front of the player. The player has to press that button to continue. If they press the wrong button, the tile opens and lets the player fall through. Whoever gets to the end first wins. Rules – "Hop for the finish line by quickly pressing the buttons that appear on the panels." Advice – "If you press the wrong button, you'll fall down a hole and lose valuable time!" This page was last edited on December 20, 2017, at 10:39.